Dynabrade orbital sanders are now fully integrated with UR cobots through the UR+ platform. 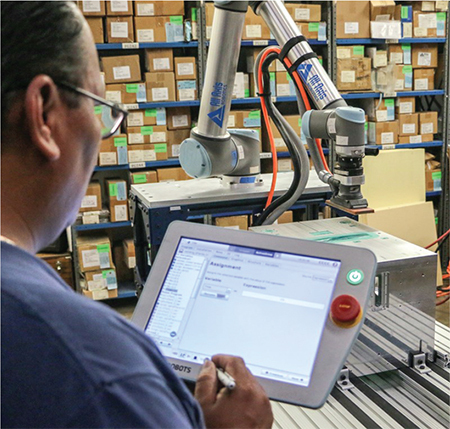 Universal Robots (UR), Odense, Denmark, and systems integrator ARC Specialties, Houston, TX, have announced plug-and-play, precision-cutting capability. ARC’s SnapCut technology uses a UR10e collaborative robot to manipulate a Hypertherm cutting torch to various cutting-path positions. Included in the SnapCut software, integrated directly on the UR+ Robots’ teaching pendant, are standard shapes—squares, rectangles, circles or C-channels that can be selected for parametric programming. Once programmed, the operator moves the cutting torch to a few locations on the cutting surface, hits run, and then watches the sparks fly.